Cockington Court, a beautiful country park and manor house nestled secretly in the chocolate box village of Cockington, quite close to Torquay. It is FREE Take your camera!!!!! Want some quiet time? A whole day of peace, or just a few hours of tranquillity. Humans were meant to walk with the seasons. We have not time to stand and stare"
Picturesque trails along serene pathways past the old manor house, lakes, woods, fields, thatched cottages, a 14th century forge and a church. Sandals are not a good idea if it is, or has been wet - is a bit muddy in parts. Cuppas available. Horse riders there are pathways for you. 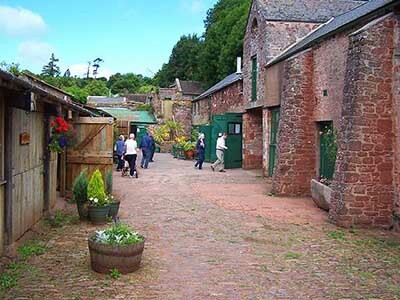 The whole complex is run by the Torbay Coast & Countryside Trust and they present a superb facility well worth a visit. The Country Park has deservedly been awarded the Green Flag Award. It is also part of the English Riviera Global Geopark. Free Admission and open daily 10am till 4pm during October to March. From April till September it is open 10am to 5pm. Cuppas can be found in the Manor as well as the shop and what they call The Kitchen Gallery which is in actual fact an interesting art gallery. The Manor House itself is being used as a base for quite a few outstanding creative artists, sculptors, artists, jewellers, glass blowers, blacksmith etc. There is even a Chocolatier! Mmmmm!!! Studio opening times are a different to those of the house itself and it is a good idea to check beforehand. Agatha Christie lived in Torquay of course and often visited friends at Cockington Court. She joined in the dramatic performances her friends organised. There has been a manor house on the site from before William the Conqueror, although not the house you see now. After the Battle of Hastings William gave lands in England to his own followers and Cockington went to William de Falaise. Ownership varied over the next few centuries depending on the relationship between the owner and the Crown, several owners lost it! The Cary family regained it on and off and eventually kept it until the middle of the 1600's. There is said to be a ghost that haunts Cockington Manor. A sad Sir Henry Cary. He was on the losing side in the Civil War and sold the manor to the Mallock family, most likely at a loss. 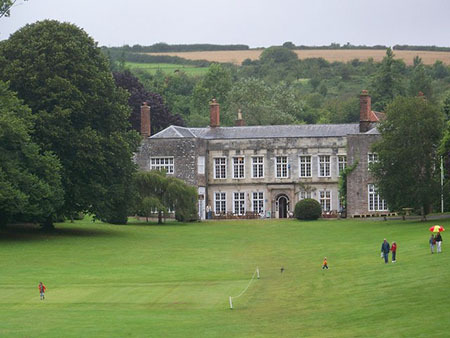 Cockington Court was held by the Mallock family until the 1930's when it was sold to Torquay Council. There was an excellent history of Cockington online but the link has disappeared. It was mainly from the point of view of the church, however the history of the Manor and the Church were intertwined. Paradise! So serene, so beautiful, wonderful in all seasons. 450 acres of it! Like all footpaths walks in the winter should be taken in stout shoes or boots of course!! The joys of the woods in springtime, buds bursting, early flowers, busy birds going about the business of nesting and the sun warming again calling us out. Summer with all its abundance attracts most people to the countryside. Small animals bustle around in the undergrowth, birds sing with delight. Autumn comes with the leaves changing colour. Ever tried scuffling dry leaves on the pathway - a childish delight that still appeals to adults!! Grown ups - Hands up - you do it too!!! Wildlife prepares for winter. The cold season of winter has its own attractions, the beauty of the shape of trees against a winter sky, a frosty day sparkling in the winter sun. Snowmen and cold starry nights. 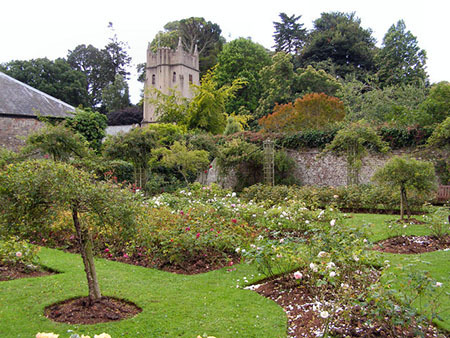 Rose garden, lawns, landscaped gardens and garden ponds. days out of delights. 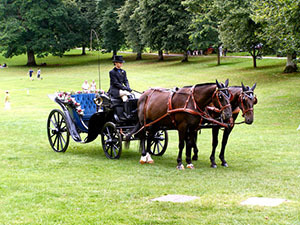 You can get here by horse drawn carriage from the beach if you feel like it, or there is a bus. 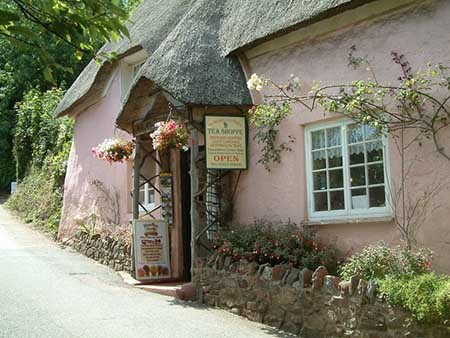 If you fancy a Devonshire cream tea - then Cockington village is just the place. The ambience of ancient thatched cottages, peaceful winding lanes, all set in the pretty wooded valley makes that cream tea perfect. Those old gift shops sell crafts that are locally made. Ideal for that special person - or yourself! The village itself goes back to at least Saxon times, those buildings are gone of course but some its buildings now go back to at least the 1500's. 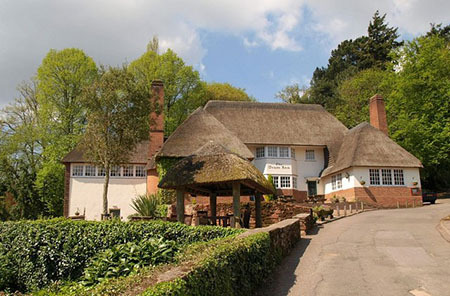 They are tucked in behind their pretty gardens under a deep thatched roof. Walk round this old medieval village. Charming and quite interesting. Weaver's Cottage (above) which goes back to the 1700's and the equally beautiful Rose Cottage with its delightful garden are pleasant tea shops. Have a look at the Gamekeepers Cottage. It goes back to the very early 1500's and may be earlier. Although the first record of it is in 1517 there could well have been a cottage there in the 1400's. The current one is a restoration as sadly it was burned down in 1990. Now used as an environmental education centre. Then there is that highly photographed Cockington Forge. Not that it is still a Forge but is a shop selling attractive horse brasses. If you would like to see a working blacksmith go to Cockington Court, there is one there. The Drum Inn opened in 1936, opposite the main car park. It was designed by Sir Edward Lutyens, the famous architect of the 1900's. A pathway leads to the cricket ground where the local “Last Night of the Proms” is held. Lovely venue. Could probably vie for the accolade of the most beautiful pub in the South West!! It was designed to be the central point of the village and it certainly fits in with the pretty place. Makes a good spot for a meal or just a drink. Can be found in Torquay of which Cockington is really a part these days. Scroll down!!! A country cottage or self catering can best be found here. Short break and need accommodation in a hurry?